The summer before I started 5th grade, I memorized Alice's Restaurant. I just played the cassette over and over again, and before I knew it, I had memorized the eighteen minute song/monologue. As you can imagine, it was the key to open the door to a rich social life which I had been missing. I kid, I kid. It was just one more weird thing to add to the list of weird things about me. 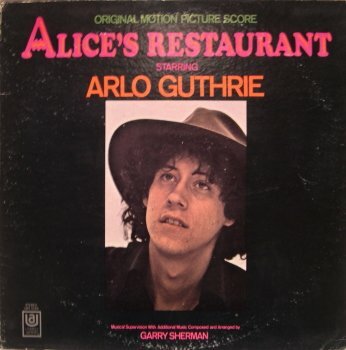 But yeah, I did love me some Arlo Guthrie. I've seen him in concert several times, and on a few occasions, he performed his biggest hit. To be fair, City of New Orleans did better commercially, but he didn't write it - Steve Goodman did. And he managed to use Kankakee in a rhyme. I still love Arlo. I've seen him in concert about seven different times, and he's always delightful. But my love of Alice's Restaurant is, well, it's something that has stayed with me. And as it happens, the older I get, the more weirdos I find out there who, like me, are just sittin' here on the Group W Bench. I'm sure I'll listen to it at some point over the holiday. I have the CD in my car, somewhere. I know a lot of radio stations play it at noon on Thanksgiving. To this day, I have yearned for a Red VW Microbus. I wouldn't mind having one to tool around in - so if you see one, even if it's not red, give a sister a call. I'd learn to drive stick for it. I went to the Urgent Care near this office this morning because I feel like there is something stuck in my right nostril. There isn't, of course, but it's sinus, we think, and the Nurse Practitioner gave me some samples. I'm taking something billed as the non-drowsy equivalent of Benadryl. Naturally, I am drowsy. Naturally. The NP was nice enough, and pretended to understand my pre-Thanksgiving Hypochondria. I am not convinced that someone didn't shove a pebble up my nose while I was asleep, and/or that it's a polyp/tumor/nodule. Whatever. For the moment, I am not dying. So, Arlo and Lump Nose aside, things are good here. Really good. I had lunch with my favorite colleagues, and we talked about all sorts of random things. Plus, it was a good lunch. Now I am winding down my work week and easing into a few days off. I have plenty to be thankful for and I know it. I am most thankful to be surrounded by kind, caring, funny people. And of course my Doodlebug, who loves a good nap as much as I do.